Welcome back to my blog ladies and gentlemen. If you have been having some problems getting to this site over the weekend you can blame GoDaddy. Not sure yet what is going on with them, but their availability has been crap for the last couple of days. I was getting really worried, but found out that my brother Ron was having similar problems with his blog which is also served by GoDaddy. He has been exploring the actual WordPress services and those appear to be working out quite well – his birding blog I mentioned previously is hosted there already. Depending on how things work out, there may be a switch considerations coming in the future. Until now, we’ll just use my current blog – which by the way, I have pretty much worked all the kinks out of already and has been working pretty good up to this point. Enough about the technical details, let’s get to today’s featured bird. How do you like the snout on that one! For some strange reason I have an affinity for this species hehehe. 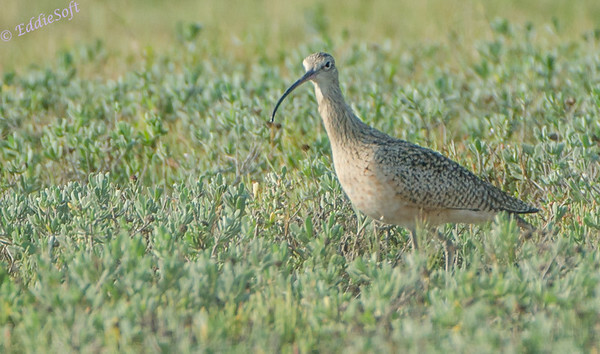 That there is a Long-Billed Curlew. To be honest, was not entirely sure when I came upon it in the digital dark room. 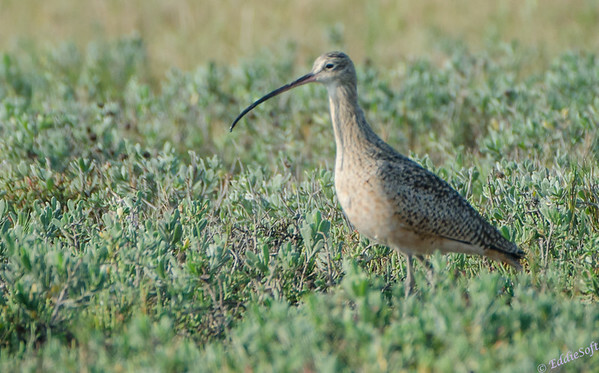 Based on the key characteristics (yeah, the snout), it could have been a Whimbrel. Decided to phone a friend (Ron) and get his opinion. 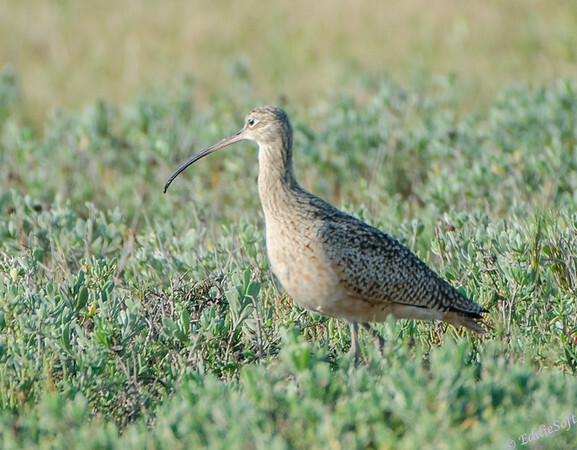 He pointed out that the Whimbrel has a stronger striped head, a dark crown with a white median stripe and generally less buffy look. 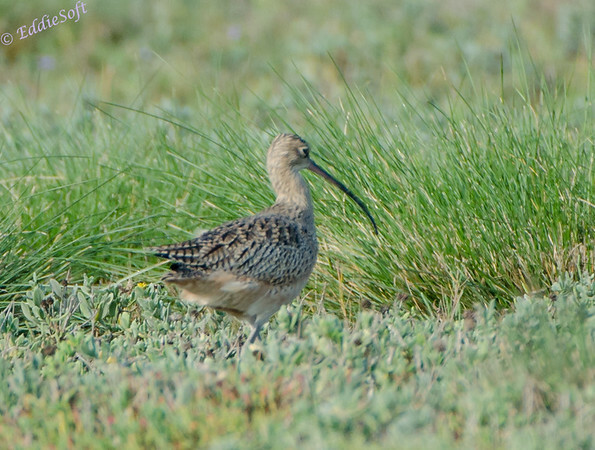 I have to agree – a Curlew it is! This particular bird was found while on our trip to Aransas National Wildlife Refuge back in November of 2013. If you recall, we were on a quest in Texas to get the very rare Whooping Crane in the tin (link here). We were cruising around the area the hotel clerk told us they were and I noticed this strange bird hanging out in a field. Was pretty excited at the time because regardless of what the species really was, I knew that I didn’t have it checked off my list – whoot! Needless to say, this is officially another +1 for the trip. How about some facts about this unique bird. First off, we were in the right region for it. Looks like it hangs out in Central America including the coastlines of Texas during the winter and then scatters across the upper West for the summer months. The fact that we were down there in the November timeframe probably means this one had not been there that long. That elongated bill is actually adapted to capturing shrimp and crabs nestled in deep burrows on tidal mudflats common to the Texas shoreline. Interesting enough, this particular one was in a field. Based on the description, I believe this one is a female (Ron had the same conclusion). Female bills are longer than the male’s but without a reference you would not be able to tell that. However, the female has a flatter top followed by a very pronounced curve at the tip. In the shot above and below, you can see how we came to that conclusion. Well, unfortunately, out of pictures. This was a chance sighting that didn’t last very long at all – besides, we were hunting Whoopers and couldn’t take a chance on missing them – we had traveled too far to let that happen. Not a bad little surprise. Hope you enjoyed seeing my latest check in the birding list. A very nice bird to have photographs of! It is distinctive enough that I know I don’t have any pics of these birds. It was disconcerting to see that this time you actually have identification shots from a few angles (what’s with that? ), but it turns out that any of these angles would probably have been enough to ID it. Thank God we were able to do that without you having to bother to wait until it flies off and actually capturing the look of its underwings. What’s more important, fully documenting a Long-Billed Curlew discovery or trying to locate some Whooping Crane?? I would think the former. I know, I know – in a moment of weakness I accidentally included multiple angles – bad Bri, very bad. I will say, it never once left the ground and just kept walking around tall weeds to purposely screw up my focus so underwing shots were out of the question short of going in after them. – with my new found experience of not going into tall grass in regions I’m not familiar with would now prevent me from even doing that – I almost stepped on an alligator in the swamps of Georiga – scared the living crap out of me but more on that when I finally get to those shots.